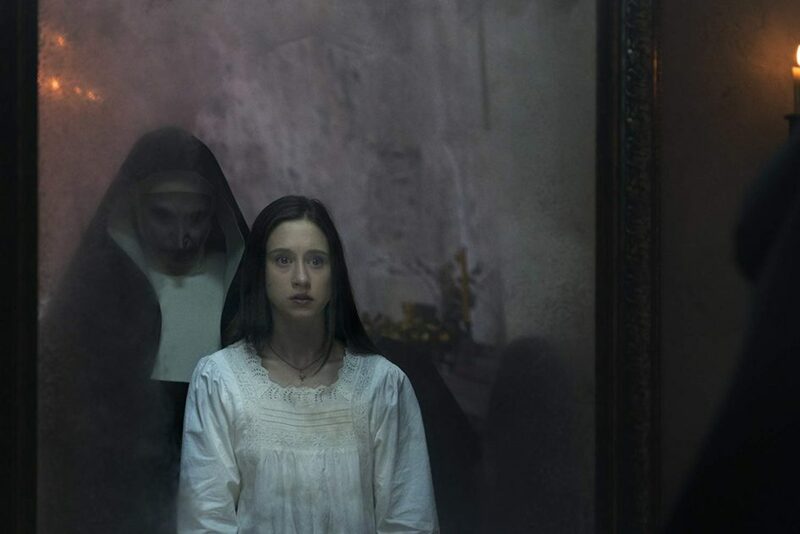 To explain the reason for The Nun to be made, you have to go back to the original Conjuring. That movie started similar to The Amityville Horror, telling us that it is based on real events. This supposedly makes us suspend our disbelief, which makes every scare even scarier. Because this movie didn’t use CGI and opted for real makeup, it actually made the tricks scarier. The first thing in The Conjuring is a story involving Annabelle and then information about the history of a couple of paranormal investigators. Then the disclaimer that it is a true story. Ed and Lorraine Warren are contacted by a family, the Perrons, who move into a new home and scary things are happening. Sure enough, when the Warrens arrive, they start to see the paranormal activity. There are secret passages and scary sightings of spirits. The Warrens try to figure out why the house is haunted. Their home is full of items that are connected to evil spirits. Things get really bad for the family, so they flee to a motel while the Warrens try to get the spirits out. Eventually, they realize a music box is the culprit. After some harrowing moments, they get rid of the spirits and the music box goes into their sanctuary for evil objects. All is right with the world or is it? Next comes The Conjuring 2. This one is all about Valak, the evil nun, who has a lot more facetime. We open with our Warren couple back from a self-imposed sabbatical, 1977. There is a painting on the wall of The Nun. The painting is pretty creepy. Side note: Per James Wan, The Nun was never intended to be a real part of the story. But during Conjuring 2, you can see figures of a nun on a table and the shadow that looks like a nun. So, intended or not, they were getting us ready for The Nun movie. This time, the setting is in England. A family has noticed odd things in their home. There had been a murder there, so they contacted the Warrens, who felt compelled to help. Family members had seen spirits and other activity. Lorraine does a seance and is drawn to the basement by a nun figure, where she sees a vision of Ed being impaled. The family goes to stay with neighbors and the Warrens try to figure out what is happening. A video gets out of one of the daughters destroying the kitchen and people turn on the family and the paranormal investigators. In this movie, we have an angry spirit that just wants everyone to leave because he died in his home. And we have Valak, the Demon Nun, as well. Valak uses the music box as a conduit to scare people and take over one of the kids. Eventually, the kids are safe, but the introduction to The Nun was a great idea, once the music box is removed. These movies are successful because who doesn’t like to be scared? So, what will The Nun be about? I hope it is about a trip to where the nun used to live, to see how Valak came to possess her and how the Warrens will save themselves. In my version, there would only be one Warren and their child is possessed. But hey, they are supposed to be psychic, so maybe they can see it coming. Be in the moment when you go see it. Let yourself be scared.